Add a classic country touch to your home with the Sawyer Mill Blue Curtains Collection. Denim blue and soft white plaid present a refreshing, farmhouse look to brighten up your space. 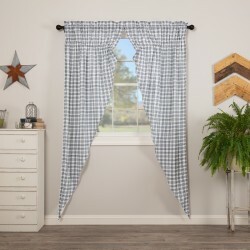 These country curtains features a rod pocket for easy hanging, lined, 100% cotton, and machine washable for easy maintenance. 100% Cotton, Cotton Lining Coordinating effortlessly with the Sawyer Mill bedding, the ..
100% Cotton, Cotton Lining Complete the look of your farmhouse bedroom with the Sawyer ..
100% Cotton, Cotton Lining Add a classic country touch to your home with the Sawyer Mil..
100% Cotton Materials Add a classic country touch to your home with the Sawyer Mill Blu..
100% Cotton Add a classic country touch to your home with the Sawyer Mill Blue Plaid Pr..
100% Cotton Add a classic country touch to your home with the Sawyer Mill Blue Plaid Sh..
100% Cotton Add a classic country touch to your home with the Sawyer Mill Blue Plaid Sw..
100% Cotton Add a classic country touch to your home with the Sawyer Mill Blue Plaid Ti..
100% Cotton Add a classic country touch to your home with the Sawyer Mill Blue Plaid Va..